More than a decade ago, Andrea Yates drowned her five children. The publicity around the case brought attention to the mental struggles of some mothers. Now, advocates are hoping lawmakers will approve mandatory screening. It has been 13 years since Clear Lake stay-at-home mom Andrea Yates phoned 911 to inform police she had just drowned her five children. In a high-profile, years-long legal saga, she was convicted in the deaths of Noah, John, Paul, Luke and Mary; sentenced to life in prison; then retried and found not guilty by reason of insanity in 2005. The jury concluded that Yates had suffered from postpartum psychosis, a rare disorder with symptoms that include hallucinations and delusions. The horrific deaths of the Yates children in 2001 and the publicity surrounding the trial brought national attention to postpartum depression and greater focus on postpartum psychosis. It is estimated that while psychosis is rare, up to 20 percent of new mothers suffer from some sort of depression after having children, according to Postpartum Support International, a group that promotes awareness of the illness. The Yates case and those of other mothers who took their children's lives have resulted in greater publicity about mental illness and depression suffered by mothers. And that has changed the way doctors in Texas and nationwide have looked at the illness. As the 2015 legislative session approaches, mental health advocates are hoping that new laws could further increase awareness and prevent tragedies like the Yates family experienced. “I think it’s made a huge difference,” said Dr. Lucy Puryear, the medical director of The Women's Place: Center for Reproductive Psychiatry at Texas Children's Pavilion for Women in Houston. Puryear, who interviewed Yates a little more than a month after her arrest in 2001, testified in the Yates case about postpartum depression and the rarer postpartum psychosis from which Yates suffered. “It’s pretty rare now that I run into OB colleagues, in particular, who don’t know about postpartum depression and are not in some way aware of it," she said. In Yates' case, she told doctors after her arrest that she believed that to keep her children from Satan, they must be killed. Yates had previously been hospitalized and attempted suicide, and before the drownings, witnesses saw her pacing in circles at home. Before the Yates case, Puryear said, prospective parents could leave an obstetrician’s office without ever hearing about the condition. Yates’ struggle with the illness and the lack of awareness of the condition left an impact on her attorney, George Parnham, and his wife, Mary Parnham. The two have worked with Puryear to educate patients and medical professionals about how to identify postpartum depression and the more serious postpartum psychosis. 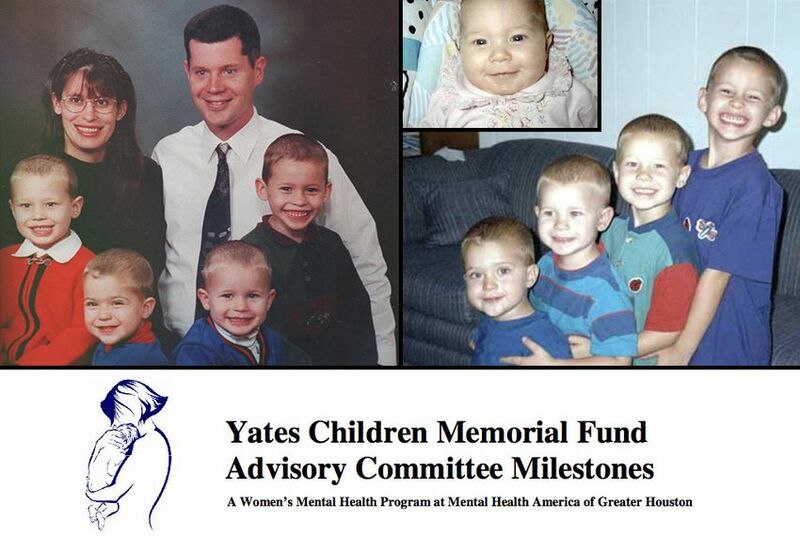 They established the Yates Children Memorial Fund shortly after Yates' first trial. It helps teach medical professionals how to detect symptoms of depression in new mothers, including severe mood swings, a loss of appetite and feelings of shame, guilt or inadequacy. The Yates Children Memorial Fund, with Mental Health America of Greater Houston, has trained more than 2,500 medical professionals and distributed more than 575,000 brochures about the illness. The Parnhams were behind what became the Andrea Yates Law, which the Texas Legislature passed in 2003. It requires hospitals and medical professionals to inform patients about post-partum illnesses. Ahead of the 2015 legislative session, the Parnhams are working on a measure that would make postpartum screening mandatory. “That is an absolutely brilliant idea,” said F.R. “Buck” Files Jr., attorney for Deanna Laney, a Tyler mom who in 2003 while suffering from postpartum psychosis stoned two of her sons to death. Files believes mandatory screening for mental illness could help physicians detect problems suffered by new mothers and perhaps prevent tragic outcomes. Laney, like Yates, was found not guilty of capital murder by reason of insanity and was sent to Kerrville State Hospital for treatment. She was released from the hospital in 2012, and a gag order in the case bars Files from talking about his client. "I can’t talk about her treatment plan," Files said of Laney, whose case is reviewed each year by the court. "I believe she is doing remarkably well." As for Yates, Parnham hopes his client will also, one day, be released. She remains hospitalized in Kerrville. The state hospital staff there requested that she be allowed to begin making day trips outside of the facility. The request was rescinded, though, because they worried that details about her treatment would become public, Parnham said. "That is always on the horizon," he said. "And it is something I’ll discuss with the hospital. There’s no timetable."